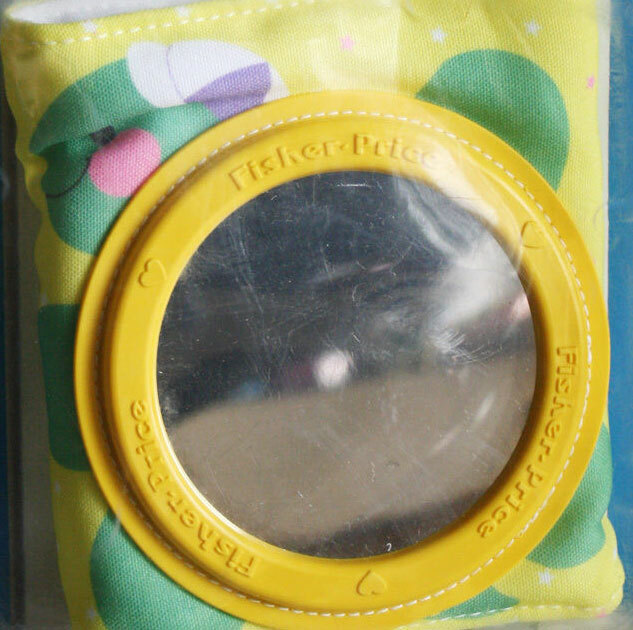 #1327 Crib Wrap Arounds "Mirror Turtle"
Description: Crib Wrap Arounds are soft cloth activity toys that wrap around baby's crib bars. The #1327 Crib Wrap Around features a turtle with a mirror as his shell. Machine washable and dryer safe. Designed for children ages birth to 18 months old. FPT19085 - Soft stuffed fabric rectangular activity toy that wraps around baby's crib bars. Each end of the toy has a Velcro® brand closure to keep the toy attached to rails. The toy has a printed design on one side of a green turtle with a mirror in center. The mirror has a blue plastic rim marked with 3 raised molded hearts and 3 raised molded "Fisher-Price" words. The turtle has a pink printed cheek and a purple and white striped night cap.